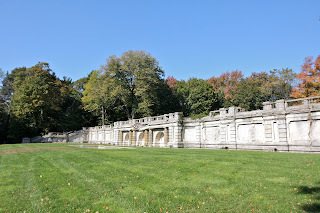 The garden wall at 'Spring Hill', originally the William L. Stow estate designed by John Russell Pope c. 1903 in Old Westbury and later owned by Henry Carnegie Phipps. Click HERE for more on 'Spring Hill' (be sure to scroll past today's post). You would think if Kean was really intent on "selling" the wall as a historical feature of this lot they would have by now taken some remedial repairs to it rather than let it crumble away. Each post of this wall every few months over the years, shows more deterioration and serious unchecked damage making it more and more likely to be be replaced with a new wall, whether it resembles the older one or not. I would've thought the parcel with the wall would be retained as a communal green-space for the greater development to enjoy. The development efforts done at Hartley Farms in New Vernon, NJ always seemed to be done with a great deal of preservation of the former Remington Arms heirs estate. Off topic, sorry Zach, but I suspect a few folks have followed other estates ... the Vanderbilt heirs have unexpectedly sold off "Elm Court" in Lenox/Stockbridge MA which has been in the family since 1886. Reborn as a high-end B&B in the recent decade the owners pitched it for sale a few times (as a whole estate and then another time in separate parcels) but that all went cold. The 90+ acre historic Peabody & Sterns design property - purportedly claimed to be the largest shingle-style home in the US - was sold in July 2012 for $9.8 million to a boutique inn focused company from Colorado. Almost $10M despite not having puppies in a basket!